Is there one strategy for running a business? For sure not. Through time the world change therefore also the business model and it will keep changing. Still there are some foundations/basic rules you can follow to help you executing business. 1. I have a plan: "I love it when aplancomes together!" I loved to watch the A-team. One thing I learned from them: They plan ahead. Maybe the plan is not perfectly executed and maybe the plan changes but they have a common goal. That is the intention of a plan. Help people to focus on the same thing. Determine priorities, necessities, time it takes etc. - Write in a way your target audience can understand it. It helps using common templates. When writing for example a business plan there is actual a very common template to follow. - Divide short-, med- en longterm planning. You can make a 5 year plan but still you need to ask yourself what needs to be done today, tomorrow and next week. - Reflect you plan. A plan must not be realistic but it also should not only be science fiction. Be realistic but keep your targets and goals high. Give yourself a push but don't kill yourself. 2. Funding: "No money, no honey"
Yes, money does not make people happy but it makes the world turn around. Ensure your have a good understanding how much money you need to start a business and keep it running. Don't fool yourself. Every business needs to make profit. Maybe not today or tomorrow but for sure in about 3 years. And if in 3 years, how you make sure you can run it the next 3 years. Who's going to pay for the losses in the meanwhile? Workout multiple situations and plan for the worse. Also be aware of any hidden costs. When asking for funding you must make a realistic spreadsheet containing all costs and earnings. Asking for to less funding can cause trouble afterwards but asking for too much can cause investors not even to think about funding you. - An outline of your business. - Your current financial situation. - How much money you need now and in the future (plan 3~5 years ahead). - What you are going to do with the money. - How you are going to pay back the funding. - Family: Ask you family. For sure family want to help. - Banks: banks can help have give you good feedback on your business plan. - Crowdfunding: angel.co, indiegogo.com, kickstarter.com. Have a look at crowdfunding.com for the full list but also search online. sometimes there are more local platforms. - Government: Often local governments offer a lot of help when you want to start a business. Go to the city center, check their websites but also look what national government is doing to support start-ups. Also local business centers and groups can help you. In a few weeks part 2. Then we will be talking about branding, selling and people. We have come across this very comprehensive list of VPNs that was compiled by “That One Privacy Guy” (see source in template: 168 VPNs comparison chart). This unique VPN Comparison chart is comparing 168 VPN service providers across the world, and is comparing on the most important variables, such as: Privacy, Jurisdiction, Security and more. It is meant to be a resource to those who value their privacy, specifically those looking for information on VPN s (that isn’t disguised advertising). There are some other good resources that cover privacy based topics quite well, but when I started down the path of retaking my own privacy, there was very little unbiased and reliable information with regard to VPN's. Seedboxes.cc, FrostVPN, UnoTelly, Opera (Browser) VPN, Smart DNS Proxy, GetFlix, Unspyable, ProXPN, SwitchVPN, GoTrusted, VikingVPN. 168 VPNs comparison chart. It's currently available in Chinese and English language. R = Responsible:Those who do the work to achieve the task. A = Accountable:The one answerable for the correct and thorough completion of the deliverable or task. C = Consulted:Those whose opinions are sought. They are sometimes called "Subject Area Experts"
I = Informed: Those that need to be updated about the progress. Mostly stakeholders. It is used often in projects and is well known in Prince2, a project methodology. There are many variations of the RACI matrix: PASCI, RASCI, RASI, RACIQ, RACI-VS, CAIRO etc. Itespecially useful in clarifying roles and responsibilities in projects and processes. Ensuring everything is transparent. And of course we have a ready to go template to speed up project deliveries. 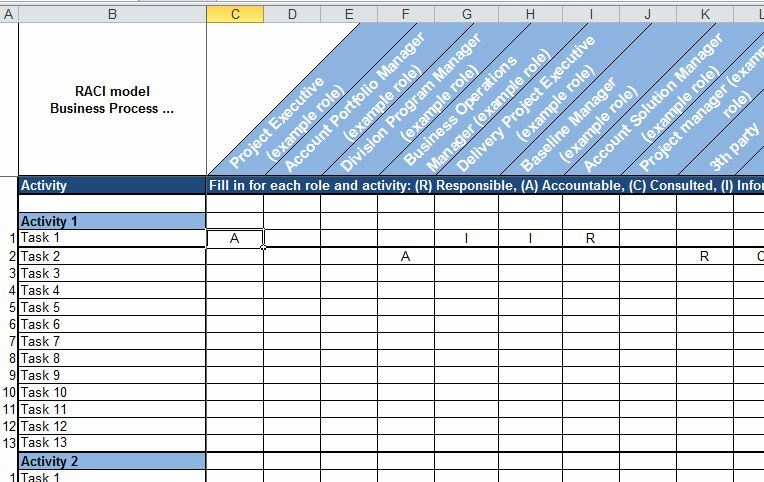 This template is created in Microsoft Excel and can be easily be adjusted to your needs.